APRIL 9--In a desperate effort to explain away his work as a paid government informant, the Rev. Al Sharpton yesterday claimed that he first ran into the FBI’s arms after his life was threatened by gangsters, an incident that prompted him to then record 10 face-to-face encounters with one of those dangerous hoodlums. That story is a lie. In fact, Sharpton’s fabricated tale is belied by FBI records that provide a clear account of when and why he began working as a cooperating informant. After unveiling his fable at a morning press conference, Sharpton repeated his claims last night at the close of his “PoliticsNation” show on MSNBC, where fact checkers and bosses alike do not appear concerned with the truthfulness of the host’s off- and on-air pronouncements. By tampering with the chronology of--and motive for--his enlistment as an FBI informant, Sharpton is furiously attempting to cast that cooperation in the most favorable light possible. He was not a rat or a snitch, Sharpton protests. In fact, the reverend contends that he was not even aware the FBI considered him an informant. The money he was paid by his FBI handler? Well, that was just reimbursements for carfare, Sharpton claims. As he explained to MSNBC viewers, Sharpton was just a victim looking for Uncle Sam’s protection and intervention. Sharpton contends that he first contacted the FBI in early-1984, immediately after his life was threatened by Salvatore Pisello, a wiseguy with music industry connections. As Sharpton tells it, Pisello was incensed that the activist was threatening to stage boycotts and demonstrations unless black promoters were given a piece of the upcoming “Victory Tour” featuring Michael Jackson and his brothers. At a press conference yesterday at his Harlem headquarters, Sharpton claimed that Gambino soldier Joseph “Joe Bana” Buonanno set up the meeting at which Pisello threatened his life. 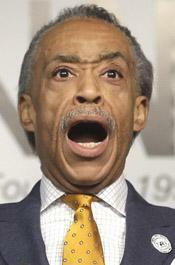 In his autobiography, Sharpton reported that Pisello traveled from Los Angeles to New York to threaten him. The book, however, makes no mention of Buonanno, who is deceased, or his purported role in facilitating Pisello’s alleged death threat. Sharpton did not bother to tell reporters how he knew Buonanno in the first place. Buonanno had been involved in the record industry for decades, and was business partners with Robert Curington, a convicted felon who also happened to be a close associate of Sharpton’s (and a vice president of the reverend’s not-for-profit National Youth Movement). Concerned for his safety, Sharpton claims that he called the FBI in early-1984 and reported the Pisello encounter. In short order, the reverend began cooperating with federal agents. Spurred by the threat, Sharpton says he taped a series of ten face-to-face meetings with Buonanno--but not Pisello, the hoodlum who allegedly threatened the activist’s life. Those Sharpton recordings--made with an FBI-issued briefcase containing a hidden recording device--spanned a three-month period beginning in April 1984, according to FBI records. As Sharpton spun out this tale Tuesday, he claimed to have detailed the Mafia death threat in his 1986 book “Go And Tell Pharaoh.” He dismissed TSG’s review of this period of his life as “old news” since he had purportedly already written the story himself years ago. However, while Sharpton’s book does refer to a menacing gangster named “Sal,” Buonanno does not rate a single mention. Additionally, Sharpton’s problems with “Sal” appear to have been settled quickly--and in the activist’s favor, according to the book. So, if Pisello was the hood who purportedly threatened Sharpton’s life, why did the FBI direct the reverend to surreptitiously record Buonanno on 10 separate occasions? Because those recordings had nothing to do with the alleged Pisello threat, according to several law enforcement sources. In fact, two investigators said they could recall no connection between Buonanno and Pisello (who was never charged with threatening Sharpton). Sharpton’s story, built on a narrative conflation, is preposterous. He wants viewers and journalists to believe that the FBI, upon being told about Pisello’s death threat, sent the reverend out wired to record another guy. Ten times. Sharpton began cooperating with the FBI in mid-1983. So he had actually been working as a confidential informant for about nine months before Pisello’s purported threat, an encounter that Sharpton now falsely claims prompted him to first contact federal agents (and subsequently begin recording Buonanno). The reverend was “flipped” by FBI agents three months after he was filmed in March 1983 (during a bureau sting) talking cocaine with an undercover agent. On a Thursday afternoon in June 1983, Sharpton showed up at a Manhattan apartment expecting to meet again with the undercover agent, who was posing as a former South American druglord seeking to launder money through boxing promotions. Instead, Sharpton was confronted by FBI agents who showed him the “cocaine” videotape. The panicked reverend agreed--on the spot--to cooperate with federal agents, according to sources familiar with the contents of Sharpton’s FBI informant file. At the direction of his FBI handlers, Sharpton initially recorded conversations with boxing promoter Don King, who was the principal target of “Crown Royal,” the FBI undercover operation that had ensnared Sharpton in March 1983. The date that Sharpton began cooperating is further fixed in a July 1984 draft of a wiretap affidavit. 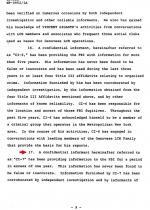 That document, sworn by an FBI agent, referred to Sharpton as “CI-7,” short for confidential informant #7. 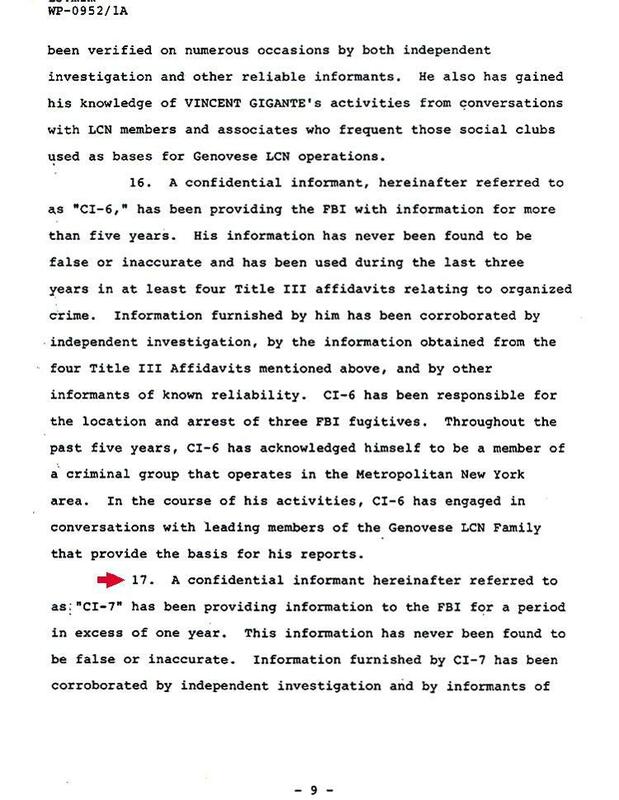 The description of “CI-7” noted that he had been providing information to the bureau for “in excess of one year.” “CI-7,” the document reported, had made a series of surreptitious recordings of Buonanno discussing a variety of Mafia business. Sharpton wants the public to believe that he used his FBI valise to secretly record a wiseguy---over and over and over again--because another wiseguy threatened his life. Oh, he has also claimed that these mafioso were allegedly oppressing black recording artists, too. So, that being the case, the FBI summaries of Sharpton’s meetings with Buonanno must be filled with references to threats directed at the civil rights leader. Surely Sharpton would have asked Buonanno something like, “Joe, why does your friend Sal want me dead?” Or even, “Joe, when you set up that meeting with Sal, did you know that he was going to threaten to clip me?” Maybe Sharpton would even take the opportunity to try and extract details of the mob’s pernicious influence on minority performers. Strangely, though, the bureau summaries contain no such information. In fact, they read as if the two men were old friends, amiably discussing topics like extortion, murder, “made” men, and a guy named “Chin.” Buonanno even told Sharpton about his eighth-grade education and his birthday. Somehow Sharpton--who appeared remarkably comfortable with the wiseguy--was able to hide any signs of duress, despite that supposed death threat hanging over his processed head. As TSG reported earlier this week, Sharpton’s involvement with Buonanno--a supposed facilitator of Mafia death threats--did not cease after his briefcase was switched off. In fact, several years later, when Sharpton and Curington were seeking to collect a six-figure consulting fee owed to them by Joe Robinson, founder of Sugar Hill Records, “Joe Bana” was one of several hoodlums who showed up unannounced at the label’s New Jersey office. The hoodlums threatened Robinson over the money owed to Sharpton and Curington, whom the Drug Enforcement Administration once termed a “Class 1” narcotics trafficker.